I recently finished up a lead architect engagement on a very large semantic publishing implementation for a finance client in the City of London. Digging out some old notes, I noticed that the delivery has been bookended by reflections on the pain caused by httpRange-14. This problem has been debated amongst some very smart people for ten years plus now without any generally accepted solution being forthcoming, and more recently I have begun wondering whether the real issue is more a function of the question itself. So as an experiment, at the start of the program I tried to take a step back to see if a different perspective might add some clarity. In doing so, I decided to revisit a book that I last read many years ago, Saul Kripke’s seminal text Naming and Necessity. The end result was a draft blog post I wrote early last year that somewhat optimistically finished with the sentence “It will be interesting to see if there are any obvious flaws I have overlooked, and what challenges are thrown up once we proceed to prototyping the solution.” It prompted a lot of interesting internal discussion at Datalanguage but in the end we decided not to publish because, as Paul pointed out, the use of blank nodes on which the proposal depended is problematic for a number of reasons. The follow-up I wrote a couple of weeks ago, and it is set out below. It evolved out of my client handover notes on URI strategy but quickly turned into another discussion about httpRange-14. Somewhat encouragingly there has been clear progression in my thoughts particularly with regard to URI binding and httpRange-14 itself, about which I’ve now reached some concrete conclusions which seem both coherent and practically viable. Value types are types which are best modelled as data: their “identity” is determined by their attributes (and for this reason, in code they are generally implemented as immutable). An example might be Postcode: in most contexts, changing the string value of a postcode simply means you have a new postcode. Conversely, Entity types have an identity beyond their total set of attributes. 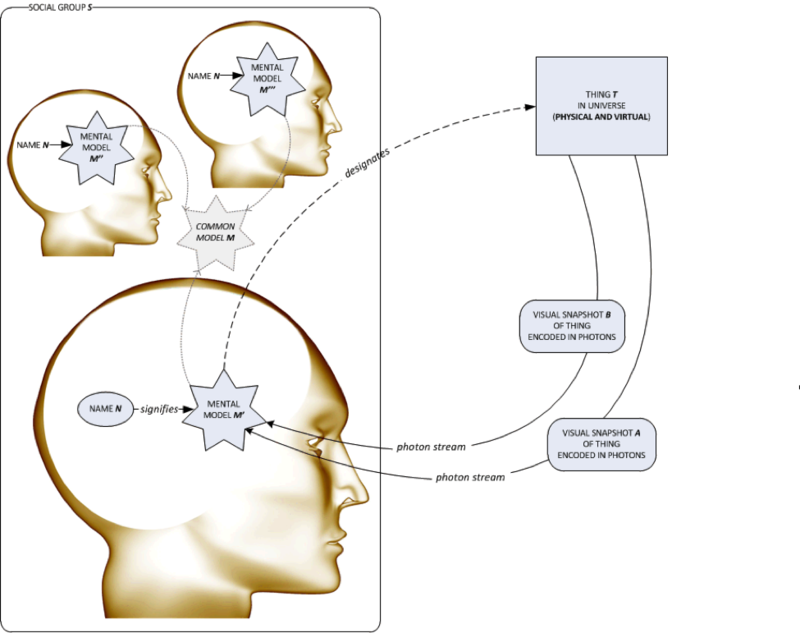 An example might be Person, where - in most contexts, at least - it makes sense to model someone as the same person regardless of which attributes might change over time (for which reason, a domain where it could conceivably make sense to model Postcode as an entity type is workflow management of postcode creation and allocation). 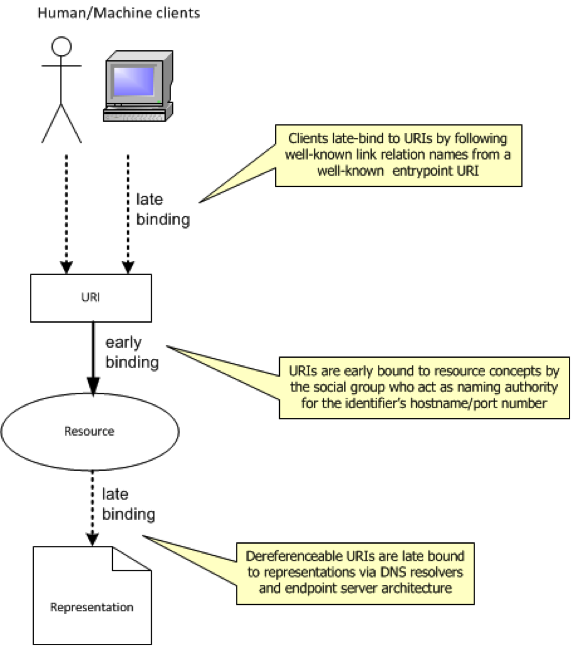 when designing URIs, start by analysing resource identity. Once you understand the > nature of the nodes in your graph, you can implement resource identification with > some degree of confidence and then move onto modelling the arcs. Putting this into practice, a helpful way of resisting the urge to jump straight into traversing the graph is to start by modelling your domain using ERD techniques and only switch into linked data graphical modelling once you’ve nailed your URI strategy. For synthetic identifiers a namespace is rarely required, apart from the case of incremental integers which should normally be avoided for other issues relating to distributed synchronisation. In the instance where a namespace is necessary, then the chosen virtual path should either be meaningless or else an intrinsic and version-independent attribute of the resource, such as type alias/label. The latter is not an entailed requirement for opaque URIs, but on purely aesthetic grounds it still seems deeply ugly to me to have URLs such as the above dereference to things which aren’t in fact representations of houses. One of the more interesting consequences of this view of resource identity relates to how reference is assigned. If resource identity is not a function of attribute values, then clearly identification (i.e. what a URI refers to) can’t be determined by attribute or property matching. The main alternative model of reference determination was set out by Kripke in Naming and Necessity whereby proper names act as rigid designators the denotation of which is set by a one-off “baptism event” at the point of creation/adoption within a social group. By way of summary for those unfamiliar with the work, Kripke proposes something of a return to John Stuart Mill in taking on the previously dominant descriptive theories of naming that had been advocated by Bertrand Russell and Gottlob Frege amongst others (interestingly, the distinction between sense and content that Jeni Tennison makes in her post about punning and httpRange-14 has echoes of Frege). Kripke objects to descriptive theories of naming on the grounds that giving meaning and fixing reference are not the same thing. Instead, Mill’s position that names have “denotation but not connotation” - which seems an excellent description of opaque URIs - is developed into the notion of names as rigid designators, which are effectively opaque identifiers whose references are bound at the point of social adoption. The notion of resource identity also has important implications in one other area. For the last couple of weeks I’ve been conducting a technical retrospective and handover to the client’s architecture team on one of the largest semantic publishing implementations in the UK right now. Part of this has been a review of URI strategy and the decisions made around httpRange-14 (or httpRedirections-57 as it has become) . Due to previous experiences of the pain entailed in coding clients against fragment identifier URIs (namely: the ambiguities introduced about whether a given fragment identifier denotes a document fragment or an NRI; the problems certain HTTP request processing frameworks have with fragment identifiers; the lack of portability to other better solutions that might be devised in future), this time we chose to adopt the 303 strategy. In doing so, we avoided the ambiguities and additional programming complexities but at the expense of performance due to all the additional, and worse uncacheable (a bug in the RFC now being addressed as part of httpBis) 303 roundtrips. For something that seemingly generates no business value to most customers - i.e. anyone who doesn’t have concrete use cases which depend on a formal distinction between information resources and non-information resources being maintained - both strategies are definitely a very long way from ideal. A resource can be anything that has identity… Not all resources are network ”retrievable”; e.g., human beings, corporations, and bound books in a library can also be considered resources. 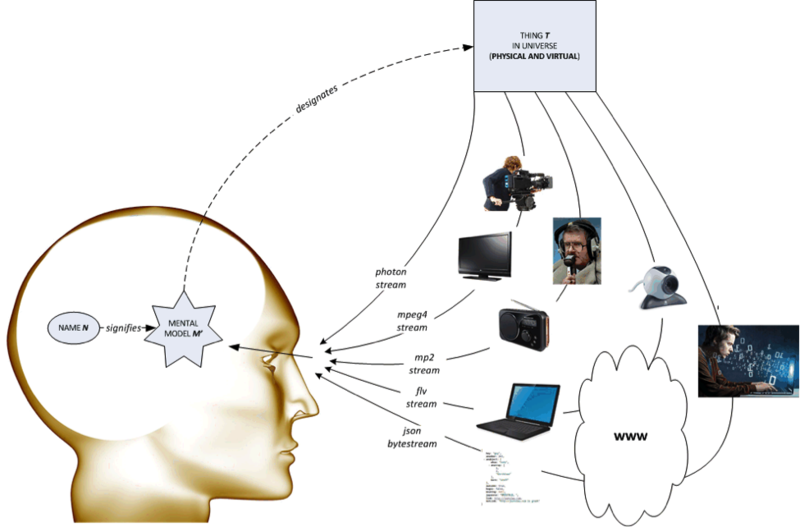 The resource is the conceptual mapping to an entity. This interpretation of the term resource I’m going to label concept-centric. URIs are late binding in all aspects except denotation: what a URI refers to is determined at creation time by its naming authority rather than at runtime via a dereferenced representation. As with new terms introduced into natural language, ambiguities or misunderstandings that arise in the early adoption of a newly published URI should be resolved via recourse to the publishing social group – i.e. the URI’s naming authority. There is no non-trivial difference between an Information Resource and a Non-Information Resource: URIs simply denote concepts in the real or imaginary universe, and optionally derefence to one or more informationally equivalent representations. 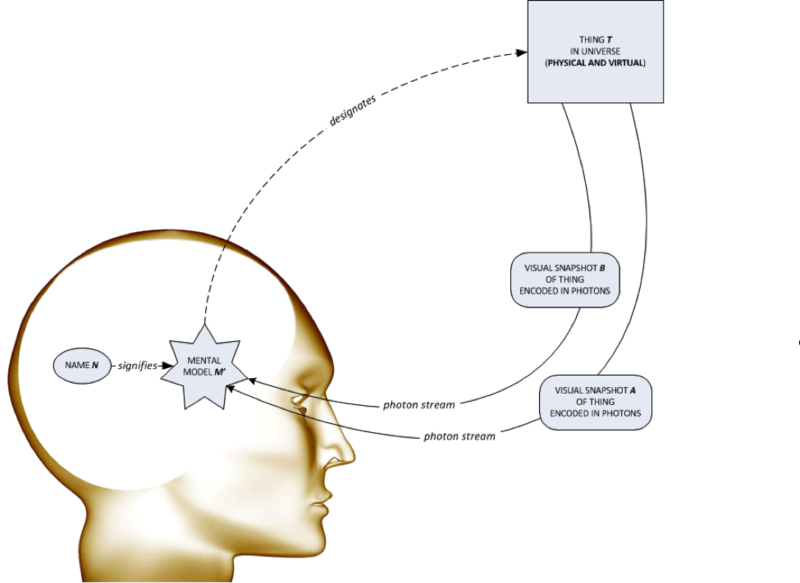 A representation is not a description: a representation is a byte stream whereas a description of a resource a distinct concept in its own right. A URI which denotes a representation (i.e. via a Content Location header) denotes the concept of a byte stream , not the byte stream itself. 303 response codes should be used solely for standard See Other semantics. Fragment identifiers should be used solely to denote resource parts. No change is required from how the web works right now. In other words by slightly changing our perspective on the problem, it essentially disappears. What about the scenarios where a naming authority has not published any/adequate information to allow URI consumers to disambiguate denotation to the extent required for the consumers’ use cases? Simple: in the absence of any better alternatives, consumers should mint their own unambiguous URIs that do meet their needs. My guess is that this will only be an issue for a few naming authorities anyway: either those participating in the linked data cloud who are currently larger enough to be used for general purposes (e.g. dbpedia, musicbrainz, etc) or else those organisations which have strategically targeted niche verticals where they perceive there to be longer term commercial advantages from owning the dominant vocabulary. It seems reasonable to request of such organisations that in order to realise their goals they conform to a more formal definition of resource that is consistent with the demands of semantic reasoners. representation as a separate resource. Web, or that of reality. just like the rest of us mere mortals. The TAG should provide an unambiguous definition of “resource” to be used by anyone building reasoners. This definition should be concept-centric. 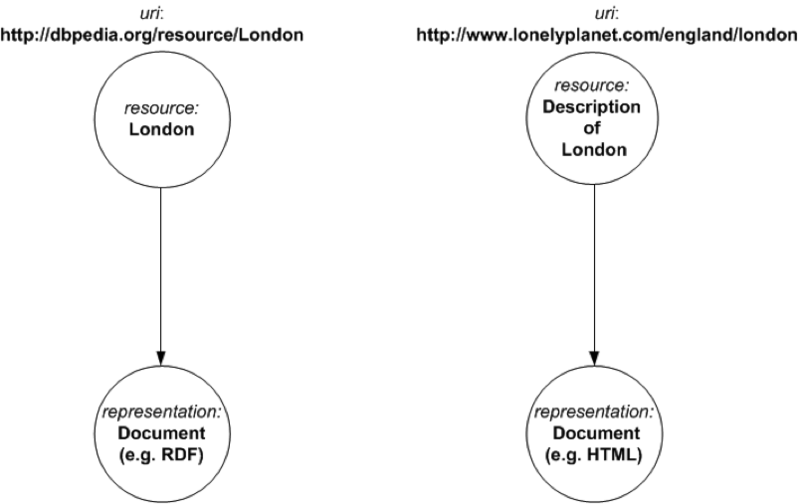 The TAG should provide a general advisory to anyone publishing linked open data that in the instance they wish their data to be used by consumers for more than simple graph traversal then they need to understand fully, and conform to, the definition of “resource” being implemented in reasoners. I think they should then stand back and let normal evolutionary drivers take care of the rest. It seems unlikely that any organisation whose business cases depend on the type of market-differentiating graph hops made possible by the power of semantic inference is going to get their notion of “resource” mixed up more than once.